The wonderful Caitlin Doyle (Poetry 2008) was the featured alumna reader at the November 2011 Writers at the Black Box, a reading series hosted by our MFA in Creative Writing students, and she’s starting 2012 off with a bang. 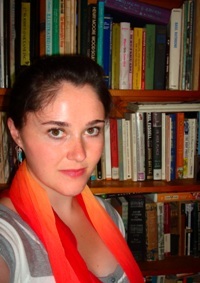 Caitlin has been awarded two recent grants through national fellowship competitions in the literary arts: a 2012 Individual Artist Grant through the Barbara Deming Memorial Fund and a Literary Grant in Poetry from the Elizabeth George Foundation. In 2012 thus far, she also has poems forthcoming in two magazines, The Atlantic Monthly and The Threepenny Review. We will provide links to Caitlin’s poems when they are published. She has also won the Amy Award through Poets & Writers, a prize given annually to three poets under thirty, and a Tennessee Williams Scholarship in Poetry for the 2011 Sewanee Writers’ Conference in Sewanee, TN. She has held residency fellowships at the MacDowell Colony and the Ucross Foundation, served as the Writer-In-Residence at St. Albans School in Washington, DC, and held the Kerouac Writer-In-Residence position at the Jack Kerouac House in Orlando, FL. Her work has previously appeared in the Boston Review, Black Warrior Review, and the Best New Poets series, among other publications.